Herbs, chicken, and penne pasta sautéed in a white wine tomato and basil sauce, then smothered in mozzarella cheese and baked to perfection. 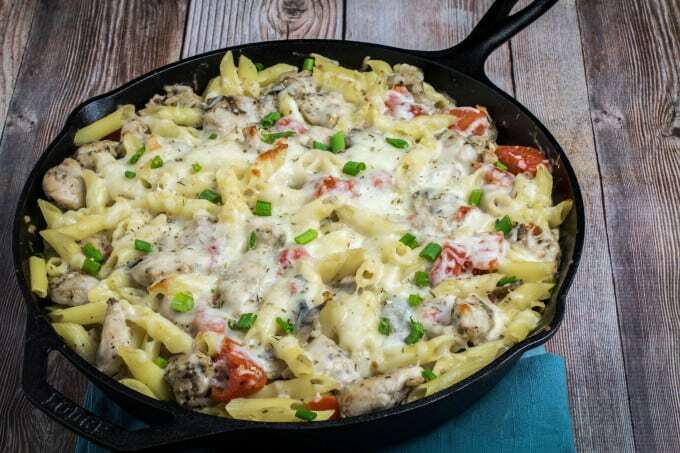 One Pot Chicken Penne with Tomato and Basil is the perfect quick and easy meal to add to your weeknight dinner schedule. Best of all, this one pot recipe is done in only 30 minutes! It’s cheesy, it’s herb-y, and it’s seriously delicious. It’s One Pot Chicken Penne with Tomato and Basil. Oh, yes… I’ll take two, please. This is definitely my new go-to recipe, especially during a weeknight. It’s quick, simple, and completely satisfying in that Italian-comfort-food kind of way. So good! Just as the name suggests, you only need one pot for this dish, making cleanup a breeze. I used my cast iron skillet, because I love how it can go straight from the stove top to the oven. If you don’t have one, don’t worry! We can work with that. I hope you had a fantastic weekend. I know I did! I finally took Andrew over to the Grounds for Sculpture (yep, I pretty much live there now). We enjoyed the art, took waaaay too many pictures, and overall just had a really awesome day. We also had a chance to eat lunch at The Rat’s, a restaurant on the grounds (they even have a gluten free menu!). I had Eggplant “Mignon”, which was a herb infused eggplant, ratatouille, roasted tomato, and mint pesto. Amaaaaazing. I must recreate it. It is officially on the list of recipes to make, although I may have to taste it a second time. Maybe a third time. Who knows? It’s for science. You can’t rush these things. Andrew had a Burger au Fromage (aka Fancy Cheeseburger), which was a burger with applewood bacon, Gruyère, provolone, Louie dressing, tomato, and red onion. Andrew says it was really good, but especially enjoyed the bacon. Or maybe it was all of the moscato we enjoyed prior to the meal. Either way, we would definitely go back again. Ok, back to the One Pot Chicken Penne with Tomato and Basil! This is probably my new favorite dish of all time, partially because I love comfort food. Especially comfort food that involves pasta, mozzarella, tomatoes, and herbs. Or any Italian dish, really. But most of all, because one pot chicken is so ridiculously fast and easy to make. 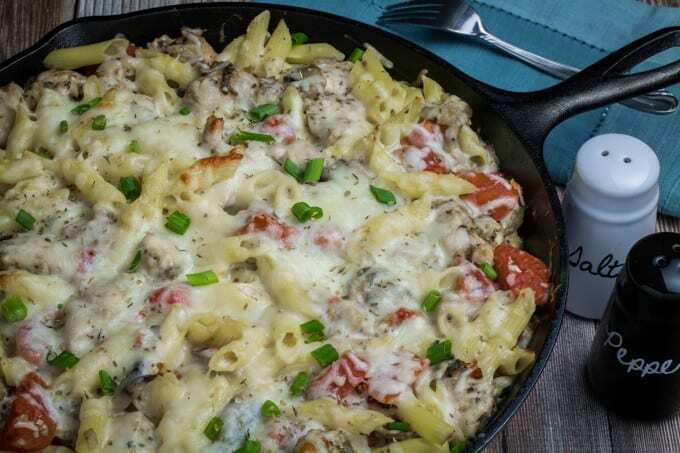 You literally cook the chicken, add the delicious flavors, mix with pasta and cheese and bake for a few minutes (just to melt the cheese and make it slightly browned and crispy on top). I used gluten free Barilla penne for this one, but you can use your favorite brand. 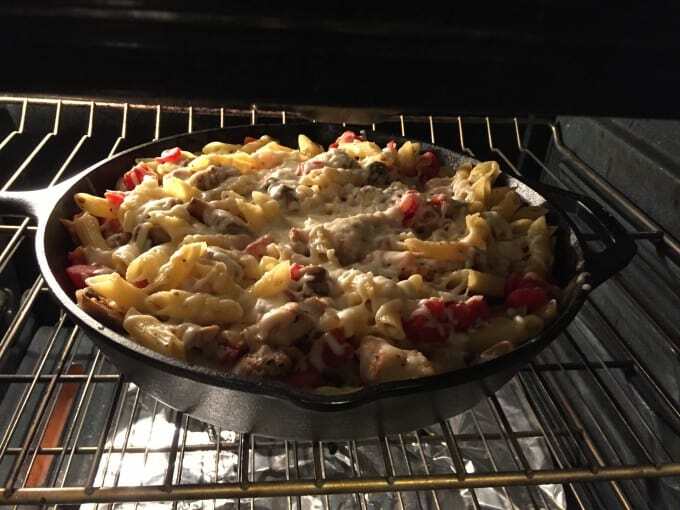 Here’s an iPhone picture of One Pot Chicken Penne with Tomato and Basil in the oven! I made this One Pot Chicken Penne with Tomato and Basil for the first time last week, after a really long day. I was up late the night before tweaking things on the blog, because I’m a perfectionist and will always find something that needs fixing, and only got about four hours of sleep. Hey, did anyone else notice the shiny new super-awesome drop down menu on the top bar where it says “recipes”? It took longer to make that than I thought it would. But it was totally worth it, because now I feel accomplished. After work, I was stuck in traffic foreverrrr. I already commute an hour each way. Add an extra hour, and there’s no promises for any of my culinary commitments when I get home. In fact, I’m pretty sure popcorn is a vegetable, and would make a suitable dinner on nights like this. Andrew disagrees. He would prefer ice cream for dinner. I digress. But seriously, if don’t have your own cast iron skillet yet, you should consider investing in one. The way cast iron heats your food just makes the flavors come out in a way that regular metal pots cannot. Mine was $15 at a store in my area, Marshalls. I know what I’m having for dinner! One pot chicken recipes are seriously perfect for Monday nights. Also, Tuesday nights, Monday’s little cousin. It’s not quite Wednesday, which shows the promise of Thursday and Friday, but you’re slightly less tired than Monday, right after a fun-filled weekend. Did you follow that? Good, can you explain it to me? 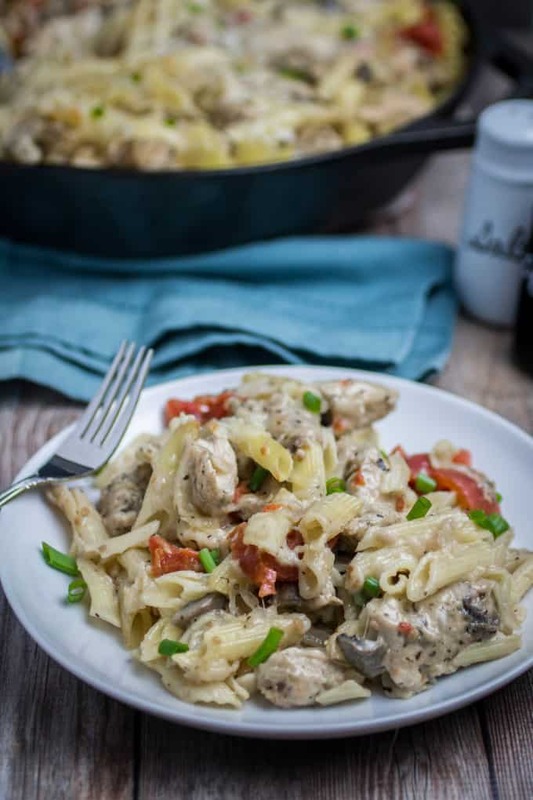 If this one dish chicken skillet recipe doesn’t brighten up your Monday, then I just don’t know what will. In a large skillet over medium heat, melt butter. Add onion and garlic and cook until softened (2-3 minutes). Add mushrooms and chicken and cook until chicken is almost cooked through. Add white wine and cook an additional 2-3 minutes. Stir in tomatoes, oregano, basil, thyme, salt and pepper. Add 2 cups mozzarella and stir to combine. Top with remaining cup mozzarella. Put skillet in the oven and bake 15 minutes, or until cheese is melted and beginning to turn golden brown on top. 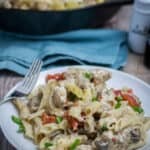 You can use gluten free or regular pasta with this recipe. If you are using gluten free, only cook pasta until it is very al dente (still a little bit hard), and rinse with cold water to prevent it from cooking further. If you don't have a skillet, make this recipe in a pot or large sautee pan. Instead of putting into oven, when you get to this step just place a lid or piece of tinfoil on top of pot until cheese melts, then serve. Even if you do it in a pot or a sauté plan, couldn’t you finish it in the oven as long as whatever you use is oven proof? I think I’ll try this tonight. Thanks! Hi Judy, absolutely! As long as your pan is oven-safe, you should be good to go 🙂 Let me know how it goes! I love hearing feedback. Could you use sundried tomatoes instead of diced tomatoes? I love their sweet flavor! Hi Kathleen, yes, I think sundried tomatoes would be great! Just watch and make sure it doesn’t look too dry. If it does, I’d add a few small splashes of water or broth. I’m thinking of trying this tonight, but with leftover smoked pork tenderloin. Wish me luck! One pot chicken, penne broccoli was fantastic!!!! Easy, kids loved it plenty left to heat up later! So much healthier than those frozen meals in a bag. Thank you for Pining it!